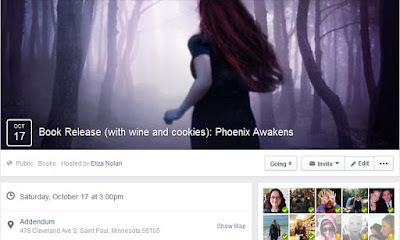 Author Eliza Nolan: Book Release Party (with wine and cookies)! Book Release Party (with wine and cookies)! Saturday, October 17, 3:00 - 5:00 p.m.
Help debut author, Eliza Nolan, celebrate the release of her first young adult urban fantasy, Phoenix Awakens at local independent YA bookstore, Addendum Books! Cookies and wine will be served! This is an open house. Come have a cookie, and say hello. The author would be absolutely flattered if you wanted to talk about her story, her writing process, or any other random topic. RSVP is appreciated, but not required!